Today was the one big day of driving, about 8 hours from Panguitch, UT to Santa Fe, NM> We hit the road early and drove straight through, with stops only for breakfast and gas. 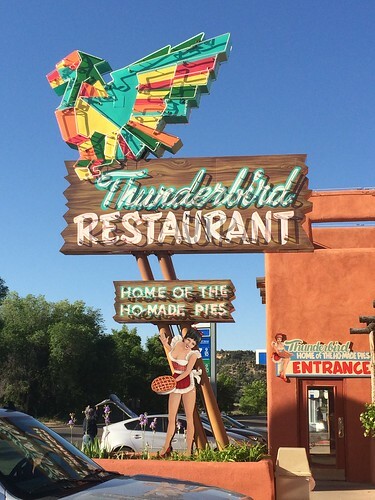 We couldn’t resist the “Ho-Made Pies” at the Thunderbird Cafe in Mt. Carmel Junction. Apparently they’ve had that motto for a long time, and decided to embrace the double entendre. I bought a t-shirt. 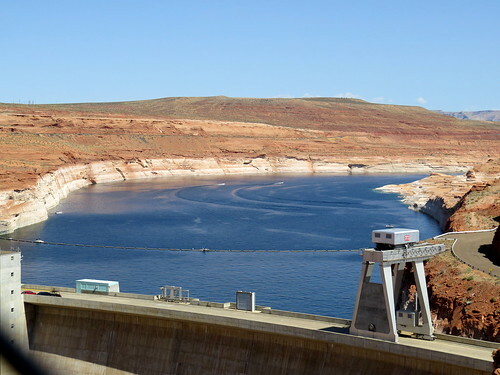 We crossed the Colorado at Glen Canyon Dam — you can see how low the water is after prolonged drought. The white area is normally under water. 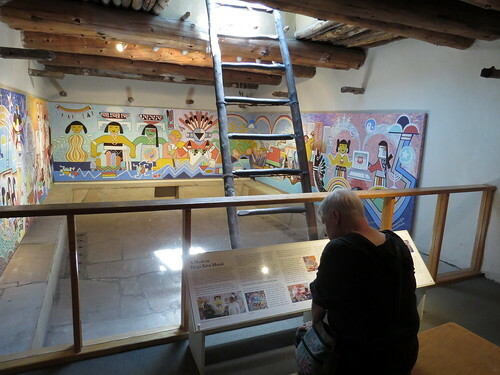 Arrived in Santa Fe without incident. 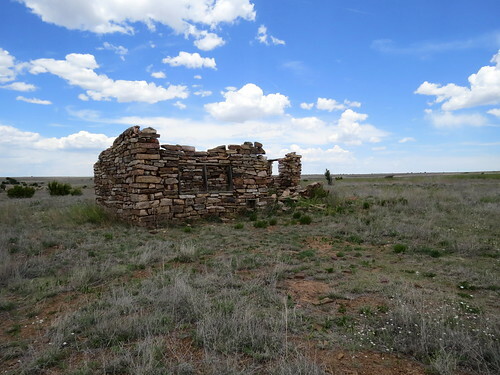 This is where we’re spending the remaining several days; I have some target birds in the area, and we’ll have to go visit the museum at Los Alamos. 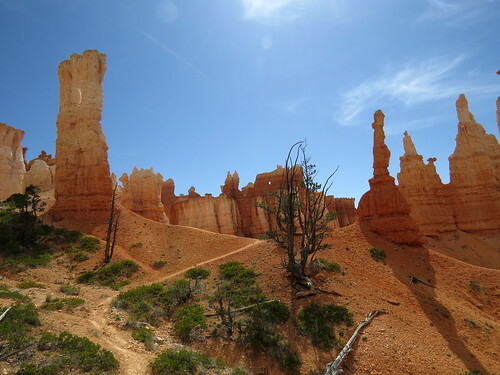 After the mob scene at Zion yesterday, I have to say I was a little apprehensive about what we’d find at Bryce Canyon on the Saturday of Memorial Day weekend. As it turns out, I needn’t have worried. For one thing, of course, we got an early start — we met for breakfast at the restaurant next door to our hotel at 7:30. The dining options 6 miles outside of Panguitch, Utah, are somewhat limited. I’m sure this comes as a shock. But the place had a perfectly good, though limited, breakfast menu. We had plenty to eat and plenty of coffee, and the waitress, who almost certainly was the wife of the cook and probably the co-owner, had a pleasantly flippant manner. We got to the park around 9, and a very pleasant ranger was directing traffic at the General Store where we parked. 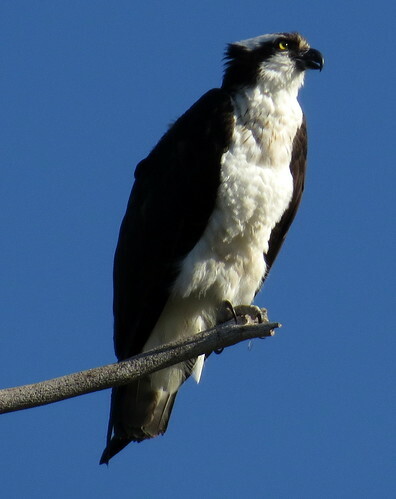 I asked her where one might look for Clark’s Nutcracker, as it was the bird I really had as a target for the park. She was sorry, but she’d only started at Bryce a week ago, and didn’t know. We had a nice chat anyway, and she gave us tips on how to avoid the crowds as the day went on. 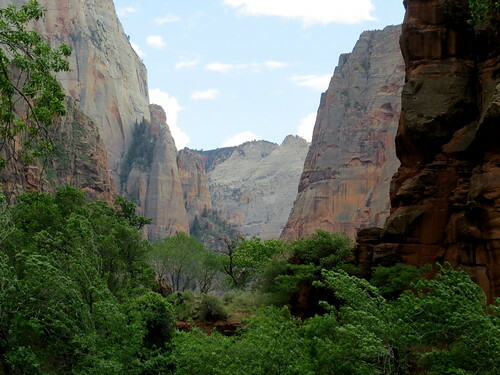 We decided to start with what is billed as the easiest hike into the canyon, the Queen’s Garden. While looking for the trailhead, and while the rest of the group was admiring the view, I saw a bird in a dead pine tree and got a good view of it: Townsend’s Solitaire! A lifer, and one I hadn’t really been thinking about that much. 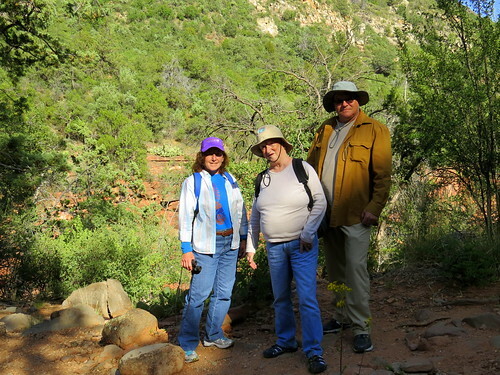 Eventually we started down the “easiest hike into the canyon”. I think it’s safe to say that the other hikes into the canyon are pretty strenuous. The trail was less than a mile round trip, but it has about 400 feet of vertical, and most of that is in a couple of steep sets of switchbacks. Robin elected to sit out the bottom half and wait for us, and she was still pretty tired by the time we got back. 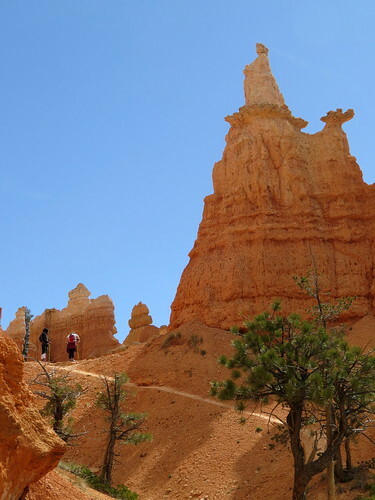 Nevertheless, it’s a beautiful trail with great views of some really amazing rock formations. On the way back up it started to rain a bit, so we figured we’d drive down to the far end of the road and check out overlooks that were easy to reach. The ranger had also suggested the Bristlecone Pine Trail, which is accessible from the very south end of the park road. 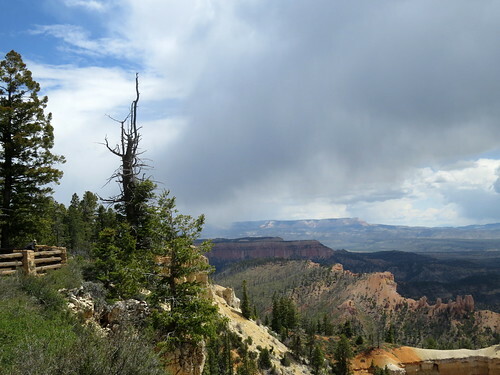 We stopped at several overlooks, had some very nice views, and finally got to Rainbow Point. Robin decided to hang out at the car while the rest of us walked the Bristlecone Pine Trail. As it turns out, it was actually easy, especially by comparison with Queen’s Garden. We did get to see some very old bristlecone pines, and it was a great walk through fir-spruce forest at over 9000 feet elevation. When we got back, we drove north to a parking lot in a burned-over area. 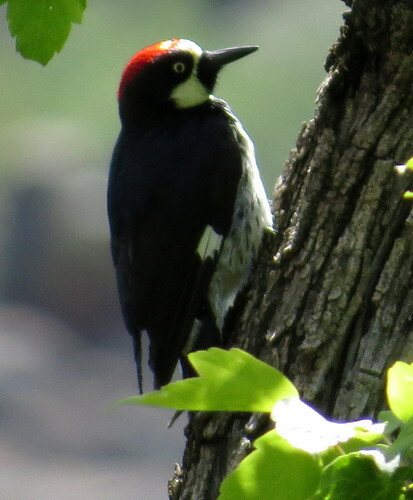 Looking for Three-Toed Woodpeckers. No luck on that, though we did see a Downy Woodpecker, some Western Bluebirds, and a couple of Mountain Bluebirds — finally I got a good look at one with binoculars. For the finale, we thought it would be interesting to go to Mossy Cave. This is an area off Highway 12, not really connected to the main park road, where there’s a waterfall and a cave with a perennial seep. 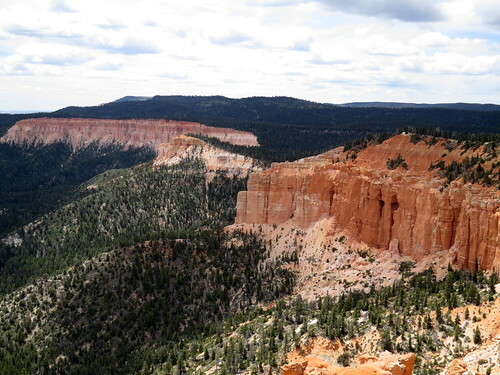 It’s down around 6000 feet, so the terrain is much more desert than the rest of the park that we’d seen. 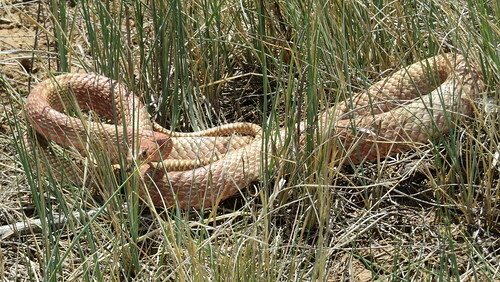 We had started walking in when I heard a raspy call, I thought, and I stopped to see if it would repeat. 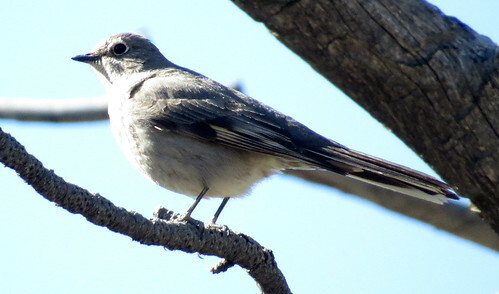 I was thinking Clark’s Nutcracker, but it didn’t happen again, so we moved on. We stopped again to look at a Broad-Tailed Hummingbird perched in a tree, and Robin said “What’s that sound?” It was the rasp again, and this time it came repeatedly from some trees on the cliff next to us. 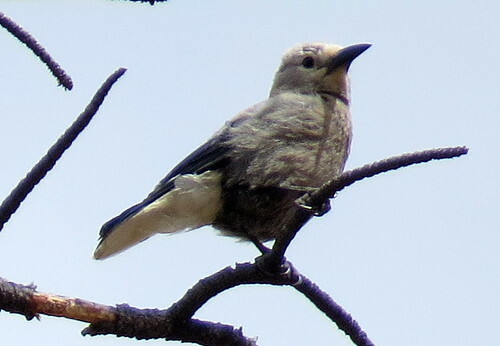 Pretty soon Hamner spotted motion, and I got the binoculars on a Clark’s Nutcracker! Another one flew in, and all of us got good looks while I got some pictures as well. By this point I was pretty happy, and in a great mood to continue up to the waterfall. This is a cool place; the Mormons dug a diversion channel to siphon some water from the Sevier River through the pass to Tropic, Utah. In some places they used existing washes, and converted them to occasional paths of runoff to a permanent stream. 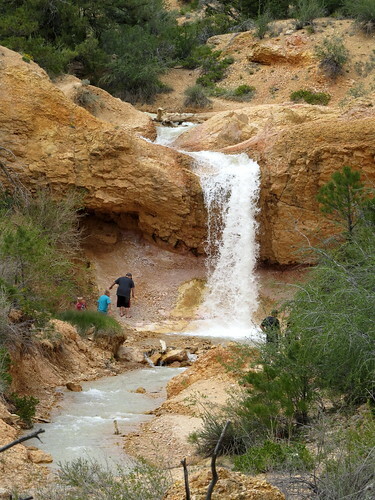 The resulting waterfall is an unexpected oasis in the desert scrub. Nearby, water seeps out of the sandstone and drips from the roof of a small cave before running down the main stream. We had a great little hike, and Robin agreed this one was worth the trouble. 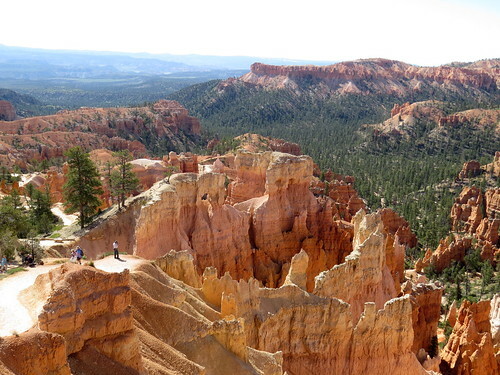 From there, we went to Bryce Canyon City outside the park gates, and had dinner. 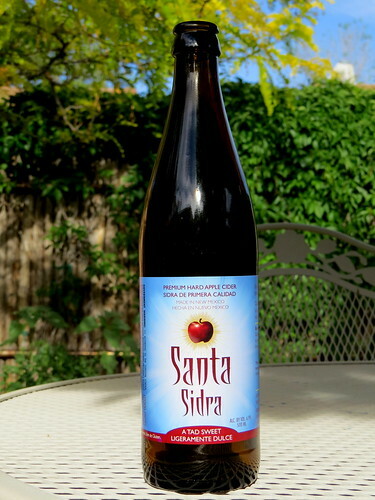 Tomorrow is a long day — over 9 hours drive from here to Santa Fe. The next morning (Friday, though it’s getting hard to keep track) we packed up and got ready to leave Jacob Lake. 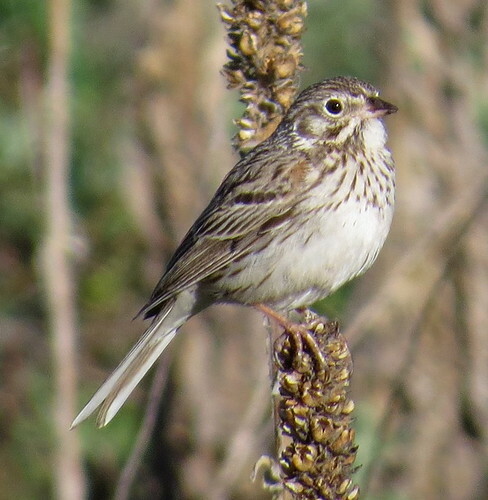 I birded a little before breakfast, but didn’t have anything new. By the time I got to the hotel restaurant, Robin, Hamner, and Peggy were already there and had ordered coffee. Still, I was in time to get my breakfast order in with everyone else. In a few minutes their food came, and the waitress apologized and said mine would be right out. She said that several more times as everyone else ate, and finally I got tired of sitting around and left. Apparently Robin talked to the manager afterward and they got their breakfast for free; fortunately, after the way we’ve been eating on this trip, I could afford to skip a meal. 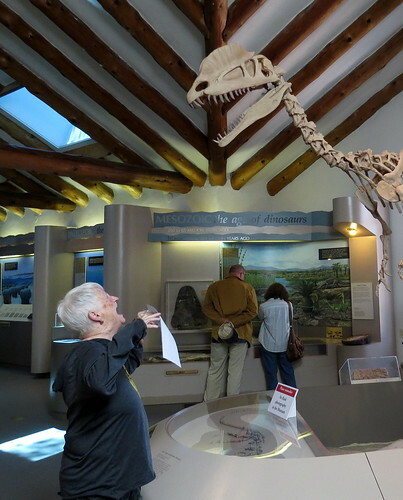 Our destination for the day was Panguitch, Utah, where we’d be close to Bryce Canyon, but on the way we planned to make a side trip to Zion National Park. It’s a hell of a drive into the park, with great scenery of cliffs and gorges, switchbacks, even a mile-long tunnel through the rock. All of this in an increasingly congested line of traffic, and finally once inside the park, there was noplace to park the car — signs told us to exit the park to the west and park in Springdale. We did that and took the shuttle bus back in. 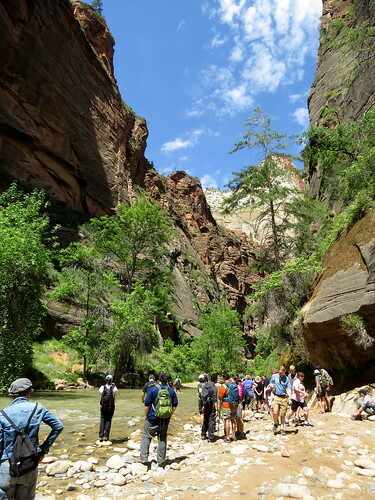 The park consists of lots of spires, cliffs, and mesas cut by the Virgin River, and unless you’re going to hike very strenuously or climb rocks, you’re pretty much limited to the narrow Virgin River valley. It’s a beautiful perennial stream in the desert vegetation, where I’d hoped to see quite a few bird species – including possibly American Dipper. Unfortunately, in the middle of the day on Friday of Memorial Day Weekend, hiking the Riverside Trail was not much of a birding experience. If you stopped to look at something, it was like parking in the middle of the interstate. The flow of foot traffic was constant and loud — one guy even had a boom box. We once again dipped on the dippers. 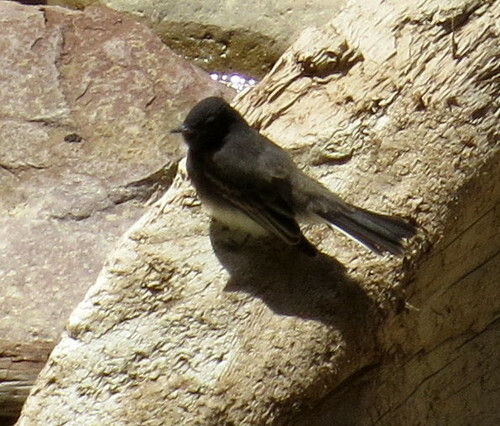 And again, it seems that Black Phoebes really like to hang out where dippers should be. After some light hiking and a lot of riding the shuttle bus, we had dinner at the Zion Canyon Brew Pub and headed for Panguitch. 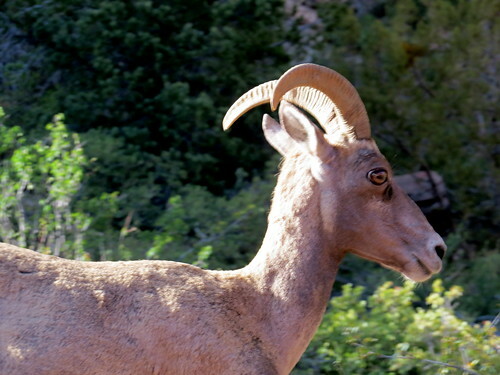 On the way out of the park we did get one mammal lifer — a bighorn sheep standing on the roadside just a few feet away. We got to the Jacob Lake Inn as planned late in the afternoon of May 25, and had a few moments of panic as their computer system said that we had reserved the nights of May 24 and 25th instead of 25th and 26th. Fortunately, Robin had the confirmation email on her phone, and they were very nice about it, finding us rooms. The meal options are limited in the area — there’s a KFC somewhere nearby, but you’re pretty much committed to eating at the Inn. It’s in the woods, with trails leading out through the pines. I never did make it to the lake, which I understand is actually just a small pond anyway. 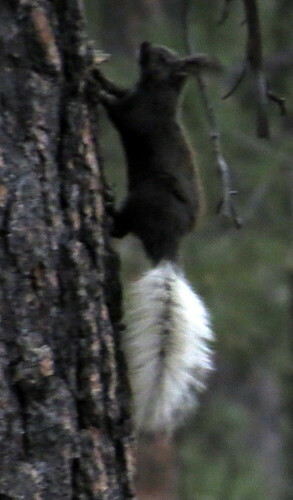 I did hike in about a mile before breakfast, seeing loads of Grace’s Warblers and Yellow-Rumped Warblers, along with a bunch of Flickers, and the very peculiar Kaibab Squirrel with its fluffy white tail. One lifer in the woods — Plumbeous Vireo, which I heard singing everywhere, and finally got some good looks at. 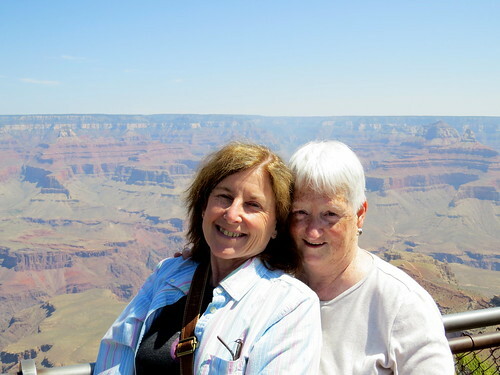 We headed for the North Rim of the Grand Canyon in the morning. 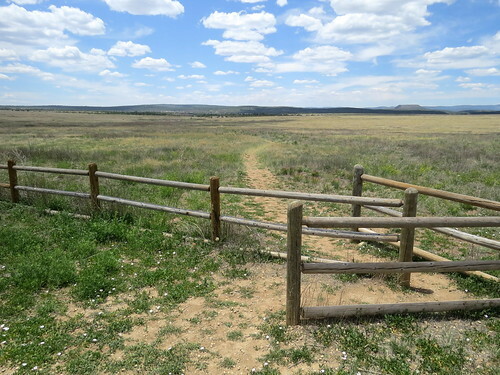 The scenery is completely different from what you get approaching the south rim; on the south, it’s high desert scrubland, while from the north it’s tall conifers and broad alpine wetland meadows. As we neared the park boundary, I looked out the window and saw a Mountain Bluebird perched on a sign — a lifer with the naked eye at 50 mph. At the park, we went to the visitor center and the lodge, where we made a reservation for an early dinner. 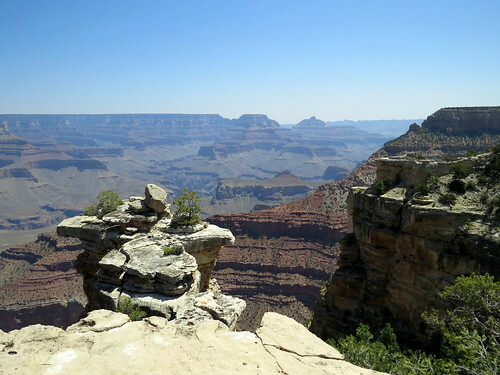 Then we decided to drive east along the rim to visit several overlooks. 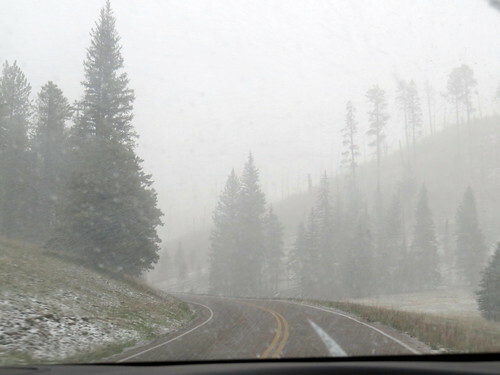 As we started driving on the rim road, it started to snow — first a few wet slushy flakes, then little snowball pellets, and eventually just big flakes and lots of them. We had some very chilly views. When we finally got out to Point Royal, the snow let up and there was a little sun for our walk out to the overlook. When we got back to the visitor center the sun had come out and it was actually pretty pleasant. As we had about an hour and a half before our dinner reservation, we decided to take a loop hike near the center, which was pleasant enough until it started to rain about halfway through. By the time we got to the lodge for our dinner, we were pretty damp and cold. Dinner was outstanding, though, so we ended the day in pretty good spirits. May 25, 2016: Condors! Oh, and the Grand Canyon. 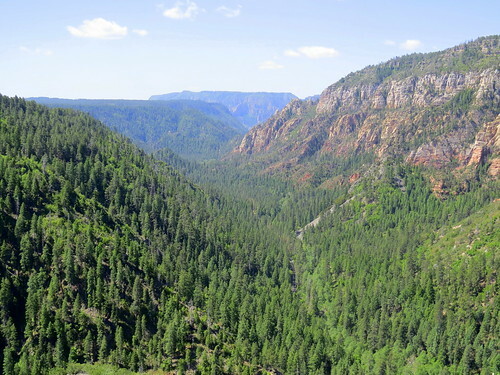 From Flagstaff to Jacob Lake near the North Rim of the Grand Canyon, our next stop, is only about a 3 hour drive. 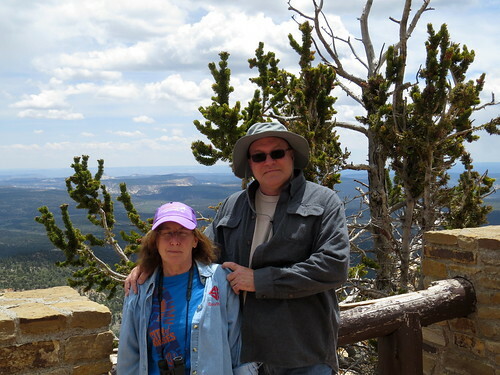 So we decided that since I’d never been, we could throw in a detour to the South Rim on the way. We got there around 10:30 or so, and I was kind of astounded at the huge crowd of people on a Wednesday morning not even really in summer vacation season. 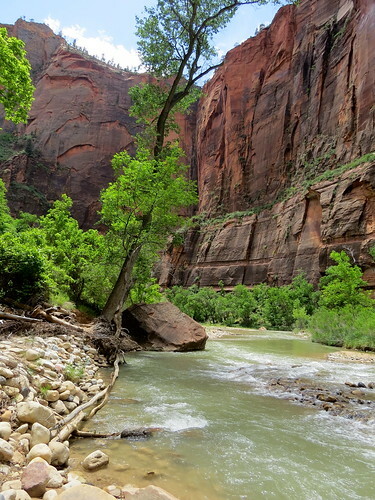 The canyon itself is spectacular, and as everyone says, it’s like being in a postcard. It’s just too big to really grasp. 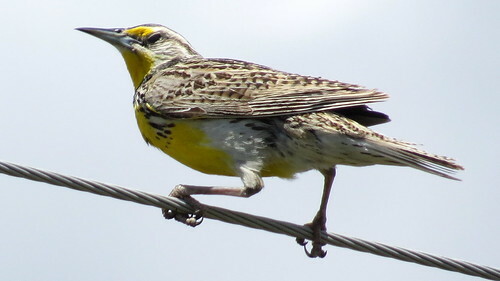 We walked around a bit at the visitor center, and I noticed some birds swooping overhead. Those long, thin wings tipped me off, and a quick look with binoculaArs confirmed that they were White-throated Swifts. Finally saw them for real, and a legitimate lifer. 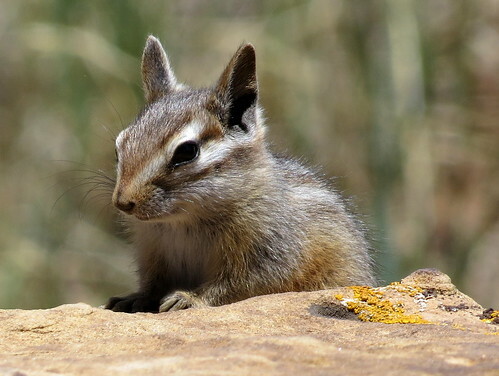 I also had a mammal lifer, Cliff Chipmunk, who was hanging around waiting for crumbs while we ate. Don’t worry, we didn’t feed the animals. No desire to get the plague. 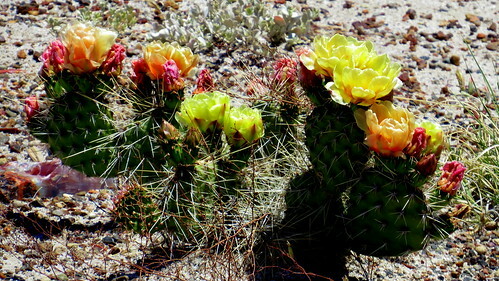 After lunch at the visitor center, we headed east to Desert View, where we had some nice photo ops. Peggy and I climbed to the top of the Watchtower, an interesting early 20th century faux-indigenous bit of architecture. 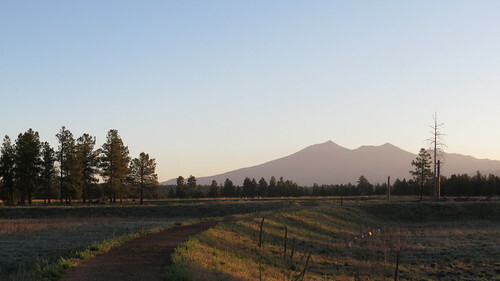 You can see the San Francisco peaks back in Flagstaff from the top floor. 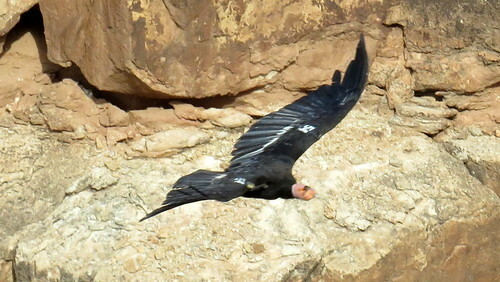 The main event for the drive, though, was to cross the Colorado at Navajo Bridge and look for California Condors. 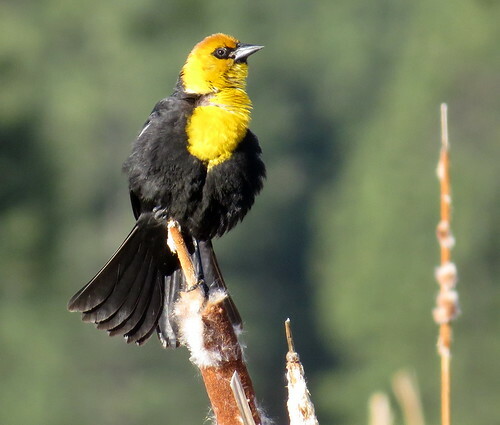 I’d checked it out in ebird in advance, and that’s the most reliable spot on our whole trip to see them. I was really a little worried that we wouldn’t see them and it would be a big disappointment. I needn’t have been. We pulled off in a parking area on the east side of the river, from which you can walk out onto the old bridge, now a pedestrian span. 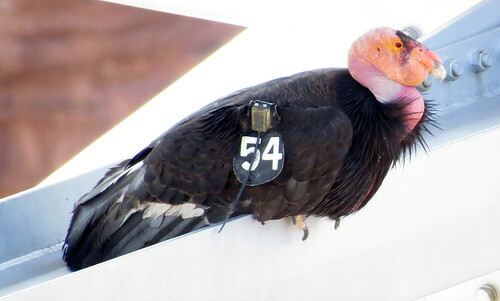 As soon as I got to the foot of the old bridge, I could see a group of guys with giant telephoto lenses all looking at the same spot on the canyon wall, and I knew that the condors must be there. 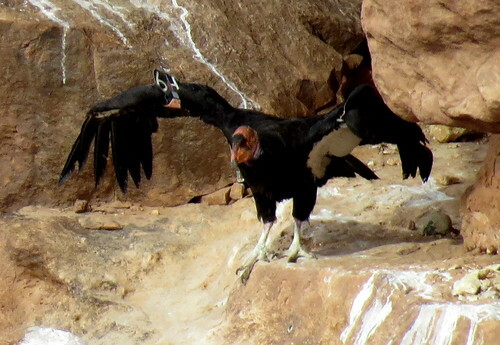 Sure enough, two condors were perched on a much-guano-stained ledge. Everyone got to see them very well, and I took way too many pics, and then one of them launched himself off the rock and soared over to the bridge. I managed to get a shot of him in flight, and then a nice close one leaning too far over the railing. Me, that is, not the bird. Then the other condor also flew, and I got a couple of shots of that one starting to take off. All in all, it was a very satisfying experience. 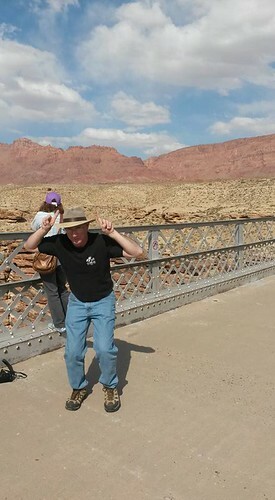 At Hamner’s insistence, I did the Chicken Dance on the bridge while he photographed me. 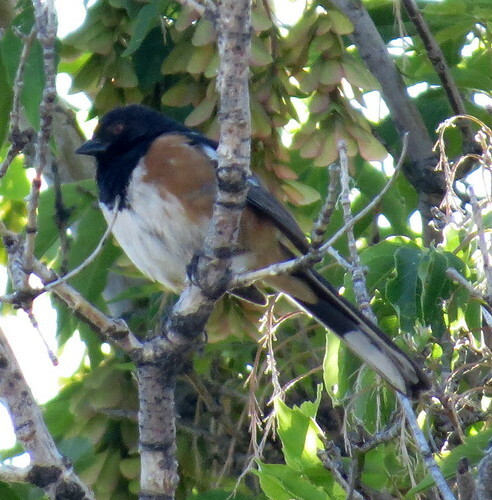 Another lifer, bringing my total to 515 — 34 in the past week on this trip. We drove on to the Jacob Lake Inn, where we’re staying the next two nights. It sits right in the pine woods, so I have hopes for woodpeckers. 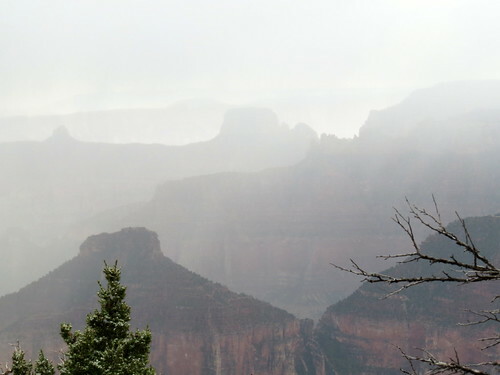 Tomorrow to the North Rim. 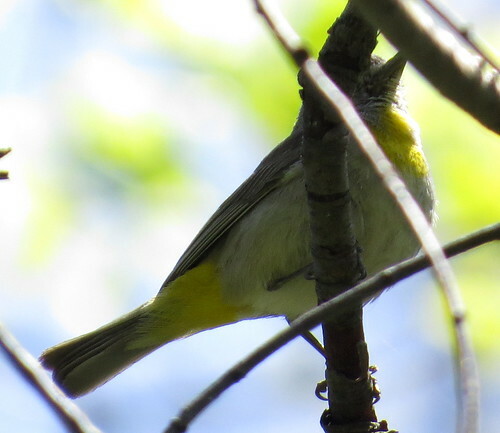 I got up a little before 6 this morning and drove back to Mummy Cave overlook, because I had just a glimpse of a bird that could have been a warbler of some kind when we were there before. It was a lovely drive out, and I was thinking about people in the area coming out the doors of their hogans to face the rising sun and scatter pollen. I got to the overlook just after dawn, and got to see the rising sun just lighting the rim of the canyon while the just-past-full moon set in the west. I couldn’t find my mystery bird, but the swifts were still active along the cliff face, and even coming to perch. 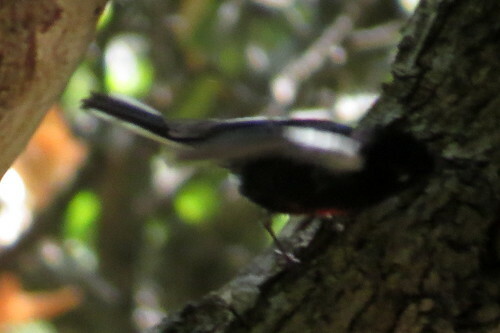 I unlimbered the camera, hoping to get a good shot of my 500th bird species. 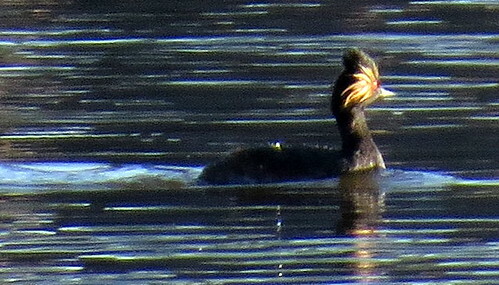 Then I got a better look. 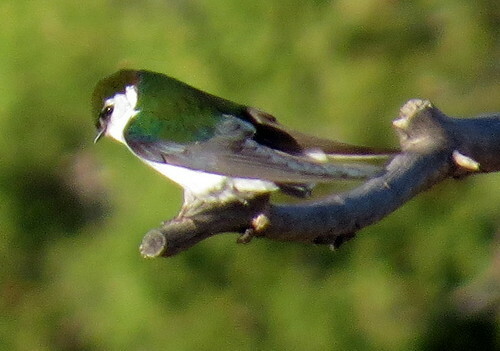 While preparing for the trip, I’d thought about how you tell a White-throated Swift from a Violet-Green Swallow, both of which have white that wraps around from the undertail up to the sides. Obviously I hadn’t thought quite enough, or else I was just too willing to believe in a new bird yesterday. I did get a photo of one; it’s not great, but it’s plenty good enough to show that it’s a Violet-Green Swallow and not a White-throated Swift. So, I’m down to 501 species total, and my 500th was actually the Rock Wren. 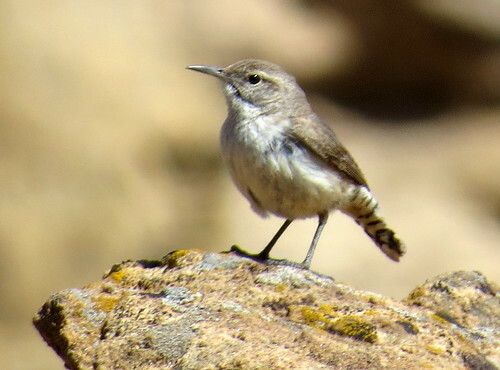 And one consolation is that I got some very good pics of the Rock Wren. So, here is my (new) 500th bird. I got back to the hotel in time for a nice breakfast of blue corn pancakes, and then we packed up and headed south. 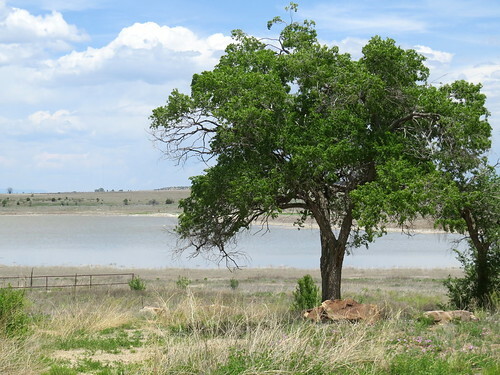 Our first goal was Petrified Forest, but I did get the rest of the group to agree to a side trip to Ganado Lake, in hopes of a Western Grebe. No such luck, but some Avocets and ducks, with a whole lot of coots and a few Ring-Billed Gulls. Then on to Petrified Forest. I’d never seen the place, and I didn’t really know what to expect. 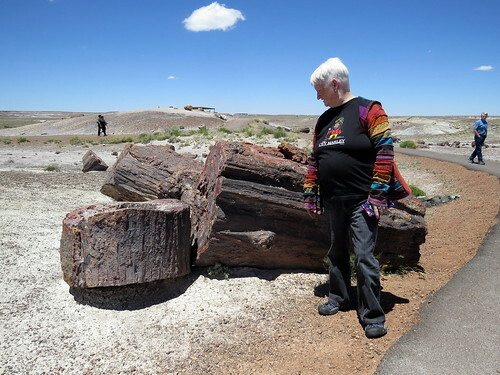 The sheer number of fossilized tree trunks is astounding. We had a good time looking at the Painted Desert. Then we walked a short trail at Crystal Forest and marveled at all the huge trunks, now turned into agate and crystals. And some cool flowers as well. From Petrified Forest our next stop was to be Meteor Crater, but we needed some lunch badly. We wound up going to Mr. Maesta’s in Holbrook, AZ — this place appears to be the original Cracker Barrel, with old photos covering the walls and rusty toy tractors and such hanging from the ceiling. I had a red chile chimichanga that was the best chimi I’ve had in years. And better yet, they had beer! 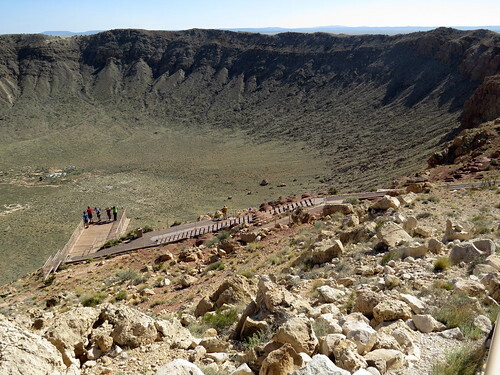 We finally got to Meteor Crater at maybe 3:30 or so. It was getting pretty hot, and we were tired, but we had to see it. 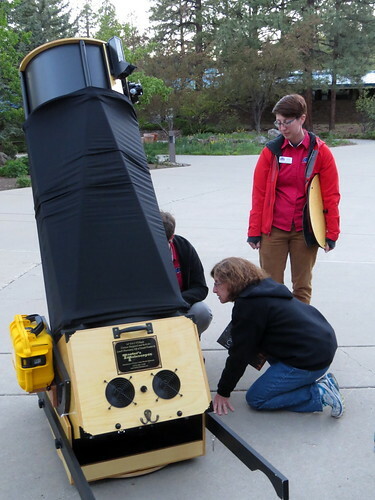 It is pretty astounding — hard to appreciate the size of it even when you’re looking at it. I was perplexed by all the space program memorabilia until I found out in their museum that the Apollo crews trained there — closest thing they could find to a lunar crater. 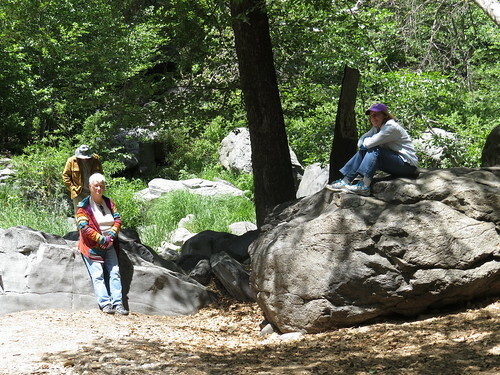 Hamner and Peggy are in this photo, but they look like ants. 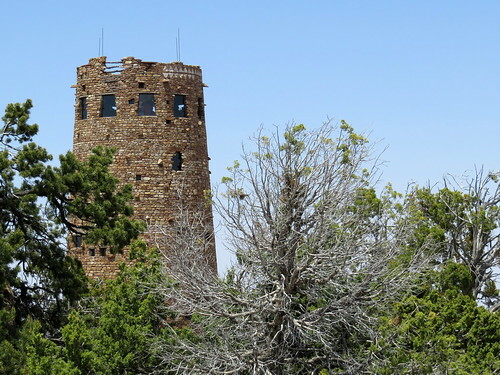 From there, it’s only a little more than 30 minutes to Flagstaff, and it’s a remarkable transformation as you go from scrawny desert scrub to tall pine forest all of a sudden. We’re in Flag for three days now, so there should be time for a variety of expeditions. Meanwhile, I could use another beer. 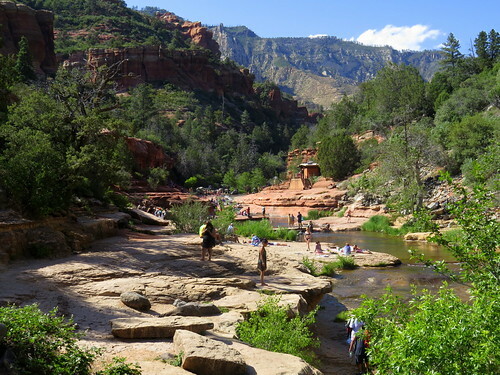 You are currently browsing the archives for the Southwest trip category.